When you’re running a small business, or even a large one, it’s useful to have what’s called a Customer Relationship Management system. It’s essentially a database that allows you, and all your staff, to keep track of current customers and potential ones. Their names, addresses, phone numbers, email, and so on. Plus details of when they last phoned, or when you last called them, and what the result of that call was. It allows everyone to keep up to date with sales which are in the process of being negotiated, invoices that need sending, and so on. 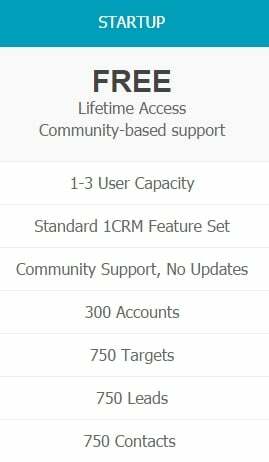 There are many CRM products on the market, at a whole range of prices. One such vendor is 1CRM (www.1crm.com) which offers software which can either be hosted by them in the cloud or which you can install on your own server. And the basic startup product, hosted on your own server and for use by up to 3 staff members, is completely free. So you can use it in your small company without charge. You’ll need a Windows or Linux-based server, and the capacity of the system is shown in the screen shot below. The download is at www.1crm.com and is around 20 MB. It’s based on the PHP programming language so it can be considered virus- and malware-free. You’ll need some server experience in order to install, configure and manage this software. But if you need a CRM for a small company, it’s definitely worth a look.